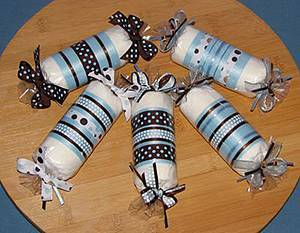 Diaper Candy to Towel Favors plus Various Edible Favors too! as Your Way of Saying "Thank You"
or to Include with Your Newborn Baby Gift. that they can actually use! Shower Party or Color Scheme. and is sealed in it's original packaging. Match Your Colors and Theme! Decorated with ribbon and specialty topper. Designed with any theme or color scheme too. A Practical Favor for Your Special Guests! and Tied on Ends With Coordinating Ribbon. 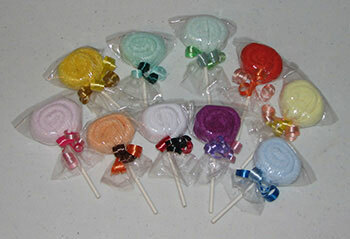 These candy measures 7"L x 3"W.
The candy measures 6"L x 2"W.
rolled to look like a big piece of candy! decorative ribbons to match the burp cloth. Pillow Mints Inside the Bottle! to include with your baby gift basket or add to the Wishing Well. Custom Personalized Candy Bar Wrappers and Personalized Tea Bags. Thank You for your guests and to show appreciation for just about any occasion. 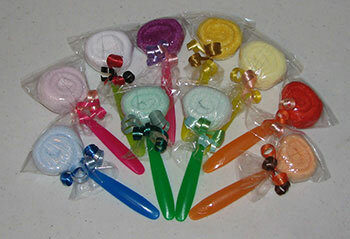 These are great little baby shower favors or bridal shower favors to hand out to your party guests. Birth Annoucements to Shower Favors and so much more! Have any of my baby cake products personalized or embroidered with your baby's name, birth announcement and theme!